Brisbane's Own 4BC. Listen in & join the conversation at 1116AM, Digital radio, mobile apps & online at 4BC.com.au. 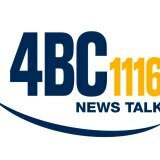 4BC occupies a unique niche in the radio landscape of Brisbane. It is the only commercial Talk, News and Information station in Brisbane. 4BC gives Brisbane people a voice and motivates them to not only actively listen, but also contribute and interact 24 hours a day. The capacity of 4BC to report news, create news and identify the issues which concern Brisbane residents is unrivalled by other stations.